There is the sweetest little stamp set in the Summer Mini Catalog called Pretty Postage. And guess what? It has a coordinating punch, called ---- (wait for it) --- Postage Stamp Punch!! You KNOW how I love stamps with coordinating punches! 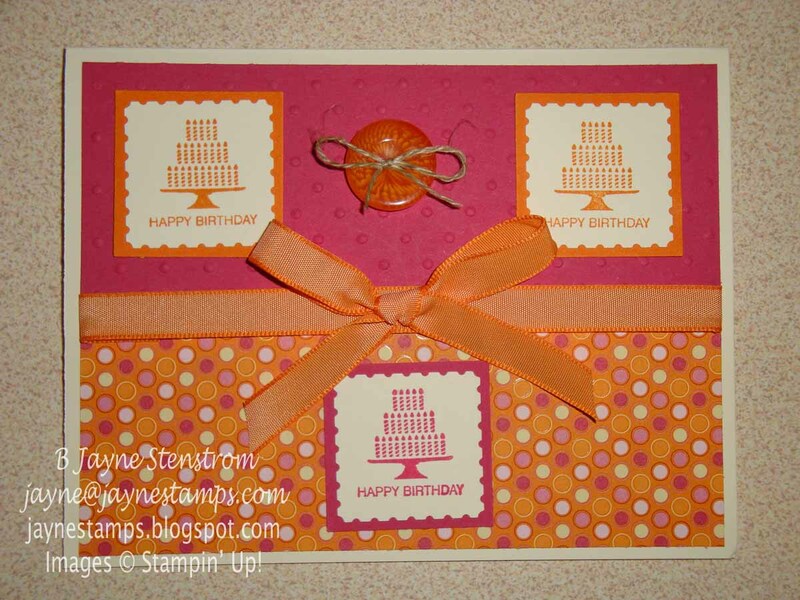 I was playing with the stamp set yesterday, trying to come up with a card for a swap I'm in. This one wasn't my final swap card, but I was pleased with how it turned out. 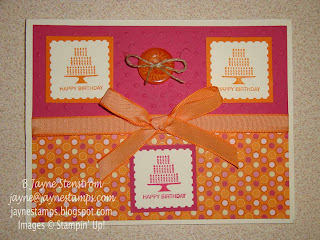 Such a bright and cheerful card for a birthday, don't you think? I think it could be a sweet and "nice" card, or you could have a saying inside about the number of candles on the recipient's cake. Not that I would do that! Tee hee! Pretty Postage stamp set, Postage Stamp Punch, 1-3/8" Square Extra-Large Punch, Sweet & Sour Specialty DSP, Brights Designer Buttons, Linen Thread, Pumpkin Pie 3/8" Taffeta Ribbon, Perfect Polka Dots Embossing Folder, Very Vanilla, Rose Red, and Pumpkin Pie card stock.